Yogurt is one of the simplest, tastiest digestive aids you can add to your diet, but not all yogurts are created equal. With so many yogurt brands and products on the market, the choices go far beyond blueberry or strawberry. Once you've found your favorite fruit flavor, then look for a yogurt high in probiotics, such as the lactic acid bacteria known as acidophilus and other live and active cultures. When selecting a yogurt rich in digestive enzymes, the amount of lactic acid bacteria such as acidophilus is the most important criterion. According to the National Institutes of Health, "'Friendly' bacteria such as lactobacillus can help us break down food, absorb nutrients and fight off "unfriendly" organisms that might cause diseases such as diarrhea." The American Cancer Society recommends a daily dose of between 1 and 10 billion bacteria, so make sure your yogurt contains the National Yogurt Association's Live & Active Cultures Seal, ensuring the yogurt contains at least 100 million bacteria. Yogurt giant Yoplait released its probiotic-rich variety YoPlus in 2010, offering "20 percent of the daily value of antioxidant vitamins A and E, a blend of special probiotic cultures and fiber for digestive health, as well as calcium and vitamin D for bone health." YoPlus contains the live cultures lactobacillus bulgaricus and streptococcus thermophilus, which Usprobiotics promotes as useful for digestion, but they are the standard cultures added to milk during the production of yogurt. Dannon released a line of probiotic-rich yogurt with Activia. It features its own unique probiotic called bifidus regularis, which Dannon claims is more effective than normal yogurt cultures because "once ingested, [bifidus regularis] survives the passage through the digestive system and remains alive in sufficient quantities once it reaches the large intestine, where Activia has its beneficial effect." Each cup of Activia yogurt contains billions of the unique culture, making it a powerful dose of probiotics. While YoPlus and Activia may be among the most common probiotic-rich yogurts in supermarket dairy cases, they are not the only ones useful in aiding digestion. Any yogurt bearing the National Yogurt Association's Live & Active Cultures Seal will contain enough cultures to keep the digestive tract running smoothly, even if it's not a recognizable name brand. 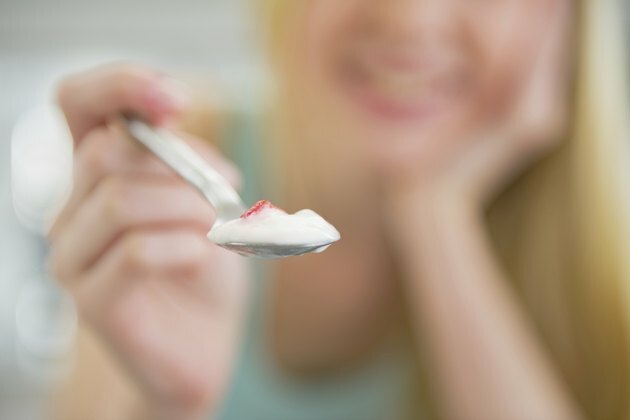 Freezing yogurt will not destroy its probiotics, but heat-treating it -- often used as a means of extending yogurt's shelf life -- will kill the probiotics.